Tade Ogidan | OGD Pictures Ltd.
TADE OGIDAN was born in Lagos. Grew up in Lagos. Attended Primary and Secondary schools in Lagos and University in the United States of America. He studied Film, Radio and Television Production, with another degree in Theatre Arts. He worked with the Nigerian Television Authority, NTA, for almost ten years. While at the NTA, he worked on landmark productions and was a highly talented in-house Writer, Producer and Director. His works won quite a number of awards in television festivals in the 80s. Notable among them would be BLINKING HOPE, THE BOYS NEXT DOOR and THE REIGN OF ABIKU (most people still remember the saga of Omotara and her Abiku playmates from the NIFETEP award-winning drama). Mr. Ogidan also produced THE NEW VILLAGE HEADMASTER, PLAY OF THE WEEK, TELE THEATRE, etc., for some years. 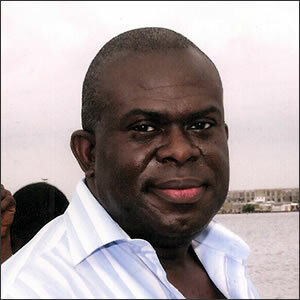 What most may not know: Tade Ogidan was a Continuity Announcer with NTA Channel 5 for a while. He left the service of the NTA in 1990 to set up his own company, OGD PICTURES LTD, which has become a household name and an industry benchmark for first class productions. OGD is coined from his surname OGIDAN. His first production under the label of OGD PICTURES is the famous HOSTAGES. He originally produced HOSTAGES as a telenovela. It was quite a struggle for a man who had just left his salaried work to embark on such an ambitious TV drama project at the time. The principal photography was done in a matter of months…about three months in fact. Then there were challenges with the very big set that would depict opulence. The team was not going to compromise on standard and scale. The project was self-funded. So his team only worked when he has shopped for money (which usually came from payments when he has shot TV commercials at that time). Some friends and family were of immense assistance as well. So the body of the project was done within like 5/6 months. Then he took on the ambition of wanting to showcase the Nigerian Police and the way we see good quality Police abroad. He waited for over one year plus (from the point of approval by the IG of Police at the time) to finally shoot the spectacular police scenes. That done, he was quite emotionally and financially exhausted. So he decided that the drama project would only see the light of day when he found a sponsor. That wait lasted over five and a half years. Chief Dr. Raymond Dokpesi saw the HOSTAGES trailer, was quite impressed and took it on board as one of the drama projects to showcase on his television station, AIT, that was about to be launched then. Due to video marketers’ pressure at the time, Ogidan edited a version for film, as Nollywood had just started then. It made great success at the cinemas and on video. It finally got released on TV; AIT. The pathways for other projects opened. Some even before the release of HOSTAGES. The movie audience will not forget OWO BLOW in a hurry. OUT OF BOUNDS too. These movies swept awards at film awards in Nigeria and abroad. Then came DIAMOND RING, RAGING STORM, 7-12, SAVING ALERO, AYO MI DA?, DANGEROUS TWINS, PLAYING GAMES, MADAM DEAREST and FAMILY ON FIRE. Tade Ogidan has produced several TV commercials of repute. Some have won awards too. He shot the very first and second Nigerian-made TV commercial to ever be shown on CNN International in the early 90s. He is the M.D./C.E.O. of OGD PICTURES and OGD MUSIC LTD.
OGD MUSIC released THE OGD ALL STARS JAMZ a few years back. That music video showcased Nigerian movie stars performing in songs. It was a fun gig, and the audience were pleasantly surprised at the extended talents of the stars featured. Tade is also a highly creative documentary producer. He produced and directed the popular drama serial BEHIND THE SIEGE. He was the Director of CRIME FIGHTERS – THE POLICE AND YOU for a while. He Directed THE INTERN BUSINESS TV REALITY SHOW. He is the project Director of the TEJU BABY FACE SHOW as well. Mr. Ogidan’s projects are quite popular at home and abroad.